This tutorial gives you a quick and simple idea how to control a stepper motor via Raspberry Pi and a Python script. Red+Green and Yellow+Blue are one phase each, in this case (4-pin bipolar motor) it does not matter if you swap Red with Green or Yellow with Blue. 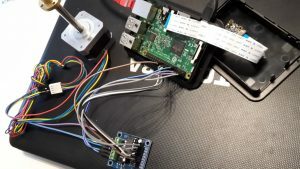 For INx, you can of course choose other GPIO ports on your RPi, but you have to fit the script. In general, I highly recommend to only power the shield (especially the motor) when it is needed, not all the time. The motor takes about 0,5A even when idle, and the L293D chip gets quite hot. So use a switch etc. for the power line, or maybe use another driver chip. i want to control bipolar stepper motor with l293d shield (i.e, arduino motor driver) using raspberry pi3. 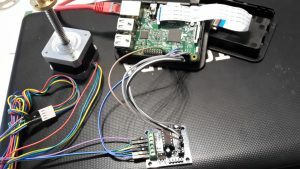 So, please help me how can i connect and programmed in python that l293d shield can be control the stepper motor using raspberry pi.